Polygonum multiflorum (also known as Fallopia multiflora, Chinese Knotweed, Tuber Fleeceflower) is a well-known herb and has been used for over hundreds of years in China. 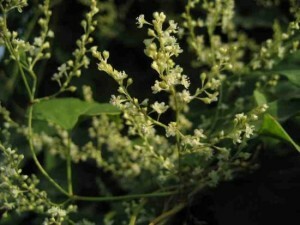 Tuber fleeceflower root wine has long been used for the treatment of white-hair disease, while the tuber fleeceflower root has been used as a beverage . One of potential therapeutic target for the treatment of obesity is fatty acid synthase (FAS) enzyme. Fatty acid synthase is an enzymatic system that catalyzes (accelerates) fatty acid synthesis. Tuber Fleeceflower root extract is marketed as fatty acid synthase inhibitor. T. Loftus  reported that treatment of mice with FAS inhibitors (Cerulenin and C75) led to decreased feeding and dramatic weight loss. However, cerulenin is an unstable toxic compound from microbes that inhibits fatty acid and steroid biosynthesis, while C75 is a synthetic derivative of cerulenin without apparent toxicity . Tian and others  examined whether weight reducing function of weight reducing herbs is related to the inhibition of fatty acid synthase. They examined 31 herbs and confirmed that fatty acid synthase inhibition is the mechanism responsible for their weight reducing effects. The inhibitory effects of the active components of tuber fleeceflower root, parasitic loranthus, green tea leaf and ginkgo leaf were similar to or greater than cerulenin and C75. Tuber fleeceflower root also significantly decreased food intake in rat models. These herbs show promise for developement of nontoxic and low-cost weight reducing drugs. According to People’s Republic of China Pharmacopoeia Tuber Fleeceflower is apparently nonpoisonous . Loftus, Thomas M., et al. “Reduced food intake and body weight in mice treated with fatty acid synthase inhibitors.” Science 288.5475 (2000): 2379-2381. Tian, Wei-Xi, et al. “Weight reduction by Chinese medicinal herbs may be related to inhibition of fatty acid synthase.” Life sciences 74.19 (2004): 2389-2399. National Pharmacopoeia Committee, 2000. The Peoples Republic of China Pharmacopoeia, second ed. Chemical Industry Press, Beijing.